IF YOU ORDERED TREES PICK-UP IS THIS WEEKEND! FRIDAY, APRIL 26TH 9AM-5PM AND SATURDAY, APRIL 27TH 9AM-NOON. SEE YOU THERE! 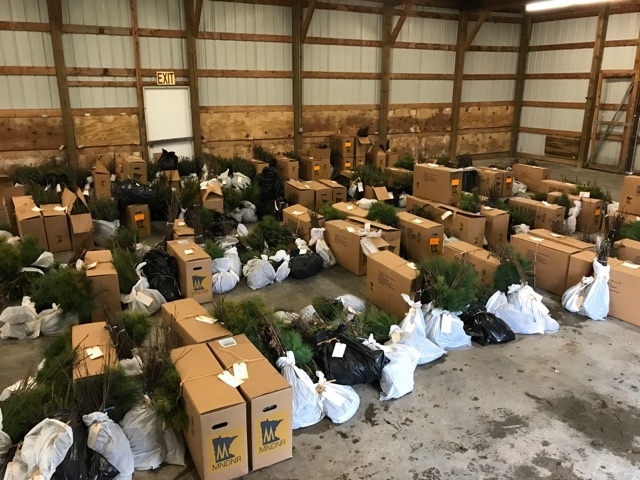 The 2019 Washington Conservation District tree sale is in full swing! Order trees online or by filling out the paper order form and sending it to the WCD office. Orders will be accepted thru April 12, 2019, however, order early to ensure that you get the species and quantity you want. Tree pick-up will be held at the Washington County Fairgrounds in Lake Elmo on April 26th and 27th. Each Spring the Washington Conservation District holds a tree sale for county landowners to purchase high quality bare root seedlings at a low cost for urban and rural conservation purposes, such as windbreaks, reforestation, erosion control, and food and cover for wildlife. The trees are sourced from the Minnesota Department of Natural Resources Nursery and Schumacher's Nursery & Berry Farm. The Washington Conservation District cannot control the condition of live plant stock and reserves the right to substitute damaged or unsuitable stock as necessary, and is not responsible for the condition of live plant stock after the scheduled pick-up days, and provides no guarantee for its condition or survival. The trees cannot be resold. All trees are bare root and sold in bundles of 25, with the exception of our Bird Packet - a bundle of 30 trees that are particularly beneficial to birds by creating habitat and food sources for them. The trees will range in height from 7-24 inches tall at the time of pick-up. We have several varieties of trees that are native to Minnesota, including conifers, hardwoods, small trees, and shrubs; there are also varieties that are not native but work well in Washington County. For more information on the types of trees available, refer to the order form or online ordering page. For more information or questions about the tree sale, please contact Jessica Thiel (email) or by phone at 651-330-8220 x 30. Annual Tree Sale - a great selection of bare root trees at a great price. Print off the order form, fill it out, and send it back with a check for payment. Come to our office, fill out a form, and pay with a check. Please note that if you order online you will be asked to use PayPal at checkout. If you do not have a PayPal account you can use the PayPal Guest Checkout option. You will receive a confirmation email after you place your order. Also note that you will be asked to provide a shipping address but the trees will be delivered to the Washington County Fairgrounds and will need to be picked up there; they will not be delivered to your address.